Today we awoke to our first morning in Shikoku! We had just stayed the night in Takamatsu which is the capital of Kagawa, Japan's smallest prefecture. What I found really interesting is that Osaka Prefecture used to be the smallest, but then they built the Kansai International Airport by building a new island in the ocean, which was enough to overtake Kagawa prefecture! Continuing with the theme, Shikoku is the smallest of Japan's four major islands and our plan was to make our way around it during this final week of our holiday. Like yesterday, we awoke to another hot and sweaty summer's day! Since we stayed at a Toyoko Inn, this morning we took advantage of their free, simple breakfast before heading out to the Takamatsu Castle, near the station. Along the way an English guy approached us saying it looked like we knew the area and asked if we knew anywhere he could get a decent cup of coffee. Apparently he'd just arrived and couldn't find any. I had a bit of a look on my phone and said/ there might be a Starbucks back near our hotel (where there was a shopping street), and gave some directions. We arrived at the castle just before 8am, and paid 200 yen to enter the castle grounds and wandered around. While I've been calling it a castle, the actual keep hasn't survived and the site is mainly just ruins with only the original walls and moats remaining, though there are also still some old buildings as well as replicas which look quite good. Takamatsu Castle was built in 1590 and was a rare example of an ocean side castle. The moats and water courses were fed by gates connected to the ocean, which was quite interesting. We spent some time walking around the pretty gardens and then climbed up some stairs to where the keep used to be. From there we got a good view of the gardens, grounds and a bit of Takamatsu City. After climbing back down we went to have a look at the fish in the moat. Now, instead of the usual carp, which would die in the salty water, the waterways were filled with Sea Bream! I bought some fish pellets that were for sale and had fun feeding the fish! One final thing to mention was that I got a random vegetable drink from a vending machine as I was feeling a bit unwell from a cold. For some reason I crave fruit and vegetables during those times. After looking around the castle for around an hour and a half we strolled down to the nearby port and caught the 10:00 ferry to Megijima which is a nearby small island that's only one kilometre wide and only four times as long. The trip on the ferry cost 370 yen and took 20 minutes. Megijima Island is thought to be the most likely candidate for Onigashima, which is the mythical ogre island featured in the legend of Momotaro (the boy who was born from a peach). Apparently this is where the peach boy fought the ogres and the main feature of the island is a cave located at the top of a hill in the middle of the island. Upon arriving at the island's small port, we went into the ferry terminal building and hired some bicycles. Low ceilings in ogre cave! Not just any old bicycles though, these were electrically powered! As it was our first time riding such ad device, the guy looking after the shop (after checking the batteries) showed us how to use the small controls on the handle bar to control the amount of electrical assistance. The idea was it wouldn't move at all unless you peddled, but when you did and if you had the electricity turned on, it would make the peddling significantly easier as well as give you a speed boost. Kind of like if someone was giving you an extra push from behind. There were three power levels, with the stronger levels giving you most of a boost but using more batteries. Getting a boost on the flat parts was great, though I did notice it wouldn't give you any more power once you were travelling above around 20-25km/h. Although it was great to be able to travel at a reasonable speed with minimal effort, the electrical assist was most useful for smoothing out the strain of hills. In fact, even riding up the islands big steep hill was really easy and fun! I highly highly recommend hiring an electric bike! 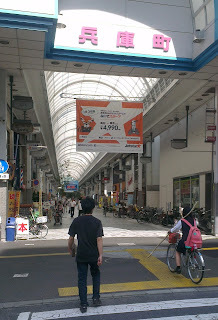 It wasn't much more expensive than a normal bike either- a few hundred yen or so. After a leisurely vertical climb we reached the island's main attraction- the Ogre Cave! We left our bikes next to the small car park and found a few cartoon statues and an extremely dilapidated old shop with an old lady who was watching a tiny old CRT TV that must've dated from the 80's! The kids toys she sold were about as old! They were still in their original packaging but both the backpacking and the toys plastic had been bleached clear from the sun! Near the shop we found the cave and paid 500 yen to enter. The guy looked at us and strongly suggested we wear the optional helmets to protect our heads. Good thing we did, as the cave was quite low in some places. At times, we had to walk around bent over at nearly 90 degrees! So yeah, get a helmet. Banging you head on cave underhung hurts much more than you'd expect (I found this out in New Zealand). Most of the cave was high enough to walk around normally though and inside we found displays referring to Momotaro (peach boy) and his defeat of the island's ogres as well a fair amount of pirate themed items (like a treasure chest), as the cave was used as a pirate hideout back in the swashbuckling days. Looking around the cave was lots of fun! Once we came out we went to the observation area right on top of the hill and were rewarded with a magnificent 360 degree view of the ocean and islands. After that we then hopped back on our bikes and continued back down the other side of the hill and then looped around the island to the Ferry terminal. On the other side of the island we found a small village and from there we followed the road back around to the coast to the Ferry Terminal. Along the way we stopped at a small beach (lined with some beach shacks and minshiku) and a friendly young lady came out to talk to us. She asked where we were from and kindly offered to take our photo! Once we had arrived at the ferry terminal we had a bit of a wait for the next boat so we got some food at the attached restaurant while we waited- just some basic tempura udon. Upon arriving back at the mainland we had a look around Sunport Takamatsu which is a redeveloped business and shopping district near the port and train station. Symbol Tower is the tallest building in the area, and we caught an elevator to the observation area at the top for another good view of the ocean and Takamatsu city. Apart from the viewing platform there were also a few nice restaurants at the top. Back at the bottom, Kate bought lots of peanuts crackers from a grocery store, we ate/drank some nice calorie free ice block things from a convenience store, had a little look inside a gym building and I lost my hat somewhere. That was the second lost hat for this trip. Eugh. While we were looking around, and then looking for my hat (no luck), a weird announcement truck was driving around blaring messages. As far as I could work out it was just dispensing local information such as upcoming school sports carnivals, but it was very annoying. Last on the agenda for today was Ritsurin Koen which is a large Japanese landscape garden often considered number four of the three best gardens in Japan. For some reason instead of going via JR, we caught the Kotoden private railway to Ritsurinkoen Station, arriving after seven minutes, then walking a further ten minutes to the garden's main entrance. The gardens were very nice and quite extensive. We walked around many ponds and had a good look around. At the back of the garden there was a cliff that was used as a waterfall when it was first constructed. As there was no artificial pumps in those days, servants were instructed to continuously use buckets to carry water to a small reservoir at the top of the cliff. We were able to look in some of the buildings, and there was a bit of a folk museum in one. There was also a small rocky hill we climbed up to get a good view over the garden and central lake. There were actually too main sections to the garden, but after we finished the first half we ended up skipping the second as we were really tired, it was hot, and I was actually feeling quite sick. It seemed like that cold I had noticed yesterday was starting to take hold. We did have a quick look at the lotus filled ponds from the entrance but otherwise we instead had a bit of a sit and relax in the rest house where it was nice and cool. While I basically just vegged out, Kate had a look at the souvenirs and food for sale and bought some sort of treat. I think it was either ice-cream or yoghurt. On the way back to our hotel we stopped to get some shaved ice from a little shop. Later on we found Kate had been badly sunburnt. And that's the end of today! Tomorrow we'll be hiring bikes again to explore Kompirasan, which is a shrine with even more stairs than Yamadera's (1368!! ), as well as one of the temples of the 88 Temple Pilgrimage before continuing on to Saijo City. Hey Eric! Glad to see you're still posting, I love reading your updates. We're just under a year away from our Japan honeymoon. We just got our backpacks (seems boring but we're excited)! Looking forward to your next post, hope all is well. Yes, I'm still (very slowly) writing the new entries. Hopefully I'll have a few more to go in the next couple of weeks due to the university holiday. I've got the next one typed up I just need to proof read it and put the photos in. Backpacker backpacks or day trip ones? We've had the same little backpacks for 5 years now, though I'm thinking of getting a slightly bigger pack to replace the little suitcase I've been using. I'm trying to bring less and less stuff each time. (Though Japan is a problem as I stock up on Japanese goods early in the trip). Glad to hear you're looking forward to your trip!